HOLTHUS / HOLTHOUSE - a name which, in researching it, brings out the closeness of the German sugar refining community in the area of Wellclose Square. In the Hoya area of rural Germany, a few miles NW of Hanover, is Bücken, with a number of outlying villages each contributing to its church registers. These registers show the baptism of Carsten Albert Holthus, 25 July 1738, son of Johann Heinrich Holthus and Christina Dorothea Ehlers, who had married 23 Nov 1730. Johann Heinrich was baptised 1690, the son of Cord Heinrich. A family tree shows the Holthus family in Nordholz back to 1608. The tree and registers also show marriages between various members of the Holthus, Dirs, and Engelke families in Nordholz, Calle, and Warpe, with the name Ludike also mentioned. In the Wellclose Square area of St George's in the East, London, in the period either side of 1800, these names Holthouse, Dirs, Engelke and Ludekins appear again, now having family and/or business connections with the Dettmar, Mertens, Lilkendey, Dolge, Batger and Witte sugar refining families. In the will of Carston Dirs I, who died 1777 aged 66, he mentions his sugar house in Shorter Street, Wellclose Square, being run by Carsten Holthouse I, and there are directory entries showing the refinery of Dirs & Holthouse 1781-1800 - the latter being the year of the death of Carsten Holthouse I. In his will, proved 14 Aug 1800 to the sum of not more than £10,000, Carsten Holthouse I names Carsten Dirs II, who must have been his business partner, as his sole executor. (When his time came, Carsten Dirs II, who died 1819 aged 60, named Ludwig Witte, George Dettmar, and his own son, as executors.) Carsten Holthouse I married Mary Dolge, daughter of Joachim Frederick Dolge, 30 June 1778, at Little Ilford, Essex. There is evidence of 2 children Carsten II, 1782, and Mary, 1792. Carsten Holthouse II followed his father's trade. In or about 1805 he went into partnership with William Detmar in the business of sugar refining at premises in Bath Terrace on Back Lane, and later in Breezers Hill and Virginia Street, until William's death in 1824. 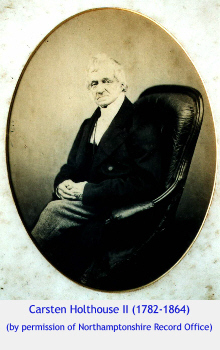 Carsten Holthouse II married about 1809, and in 1816 leased residential property in Upper Edmonton, borrowing capital from Sophia Dirs. In 1823 he extended the lease on the property, and from the events following William Detmar's untimely death it is clear that he was over-extending himself financially. William Detmar, of Upton, Essex died July 1824, aged 38, leaving a widow Mary Anne, and no will. Over the next couple of years, the full extent of Carsten's financial plight was brought to light. He owed the estate of William Detmar over £10,000. He borrowed and mortgaged further, and relinquished his interests in all the business premises in order to pay his debts. This done, Mary Ann Detmar immediately leased back to him the sugar house in Back Lane at £386 pa. During 1830 the refinery was destroyed by fire - Carsten rebuilt it, installing the very latest steam equipment at great expense, and so increasing the value of the property, however, he went bankrupt in 1833. Carsten Holthouse II married Harriet Parkin sometime before 1810. They had 5 sons - a surgeon, a lawyer, a vicar, and 2 who emigrated to Australia. Their children, in turn, appear to have followed these professions. After Harriet's death, Carsten married Anna Maria Staple in 1849, by which time he appears to be a wine merchant in Bath. His headstone in St Mary's churchyard, Smallcombe Vale, Bath. Much of this information is contained in the Holthouse Collection at NRO. The Collection was made by Edwin Hermus Holthouse, surgeon and eye specialist, and grandson of Carsten Holthouse II, who acquired the advowson of Hellidon, Northamptonshire, from his uncle, Charles Scrafton Holthouse, brother of Carsten III, and vicar of Hellidon. There are letters from Reggie Holthouse, a grandson of Edwin, who, as a serviceman, "found himself in Bücken" in April 1945. He reported that the church had been damaged, and the church records buried for safe keeping - so he could not see the written record of his 3x gt grandfather's baptism !